Rootstock stout, ascending. Stipes 8'-12' long, covered below with thin pale-brown scales; blade of fertile leaves elongate-oblong or lanceolate, acuminate, slightly narrowed toward the base, firm, bipinnate, or 3-pinnatifid, 1°-2 1/2° long, 3'-5' wide, the sterile ones commonly shorter and less divided; middle and upper pinnae lanceolate with a broad base, acuminate, those below unequally deltoid-lanceolate, the lowest elongate-triangular; pinnules oblong-ovate, constricted at the base, the lower ones nearly sessile, often pinnatifid, those above adnate and slightly decurrent upon the narrowly winged rachis, serrate, the margins spinulose throughout; sori numerous, distinct, medial or nearer the mid-vein; indusia orbicular-reniform, glandular. In low woods and wet thickets, Nova Scotia to Minnesota, south to Virginia and West Virginia. July-Sept.
Dryopteris Clintoniana X Goldiana Dowell, Bull. Torrey Club 35: 137. 1908. 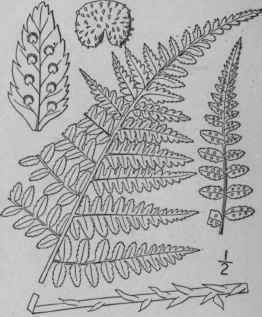 Dryopteris Goldiana celsa Palmer, Proc. Biol. Soc. Wash. 13: 65. 1899. Dryopteris Clintoniana X intermedia Dowell, Bull. Torrey Club 35: 136. 1908. Dryopteris Clintoniana X marginalis Slosson, Bull. Torrey Club 37: 202. 1910. Dryopteris Clintoniana X spinulosa Benedict, Bull. Torrey Club 36: 45. 1909. Dryopteris cristata X Goldiana Benedict, Bull. Torrey Club 36: 47. 1909. Dryopteris cristata X intermedia Dowell, Bull. Torrey Club 35: 136. 1908. Aspidium Boottii Tuckerm. Hovey's Mag. 9: 145. 1843. Aspidium spinulosum var. Boottii D. C. Eaton in A. Gray, Man., ed. 5, 665. 1867. Dryopteris Boottii Underw. Nat. Ferns, ed. 4, 117. 1893. Dryopteris cristata X spinulosa intermedia Slosson, Fern Bull. 16: 97. 1908. Dryopteris cristata x marginalis Davenp. Bot. Gaz. 19: 497. 1894, as syn. Aspidium cristatnm X marginale Davenp. Bot. Gaz. 19: 494. 1894. Dryopteris cristata x spinulosa (Milde) C. Chr. Ind. Fil. 259. 1905. Aspidium cristatum X spimdosum Milde, Nov. Act. Acad. Leop.-Carol. 26: 533. 1856. Dryopteris Goldiana X intermedia Dowell, Bull. Torrey Club 35: 138. 1908. Dryopteris Goldiana X marginalis Dowell, Bull. Torrey Club 35: 139. 1908. Dryopteris Goldiana X spinulosa Benedict, Bull. Torrey Club 36: 47. 1909. Dryopteris intermedia X marginalis Benedict, Bull. Torrey Club 36: 48. 1909. Dryopteris marginalis X spinulosa Slosson, Fern Bull. 16: 99. 1908. Dryopteris pittsfordensis Slosson, Rhodora 6: 75. 1904. Nephrodium pittsfordense Davenp. Rhodora 6: 76. 1904, as syn. Aspidium spinulosum X marginale Eggleston, Rhodora 6: 138. 1904.